Lunch is the big meal of the day here in Ecuador. Though in many restaurants you can order from a menu for lunch, most locals opt for almuerzo. When you walk into a restaurant the server will usually ask if you want almuerzo. Though it officially means “lunch,” it more specifially means the lunch of the day. If you say “yes,” you will get whatever the cook has prepared for the day, which follows a pretty standard pattern – soup, main dish, juice, and sometimes postre (dessert – typically a small bite to finish the meal). 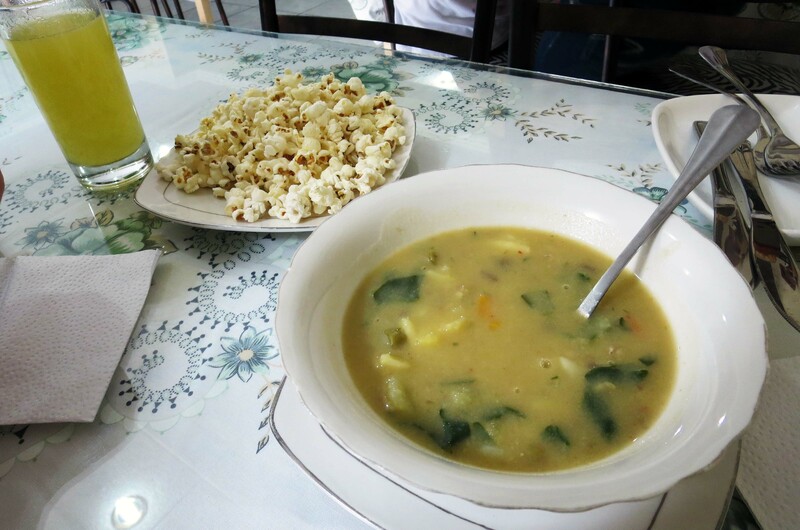 It starts with a big bowl of soup served alongside a dish of popcorn or mote (a type of corn) to drop in as you eat. My favorite is the popcorn. I like to add a few pieces at a time. It adds a unique flavor and texture to the soup. I definitely recommend it. 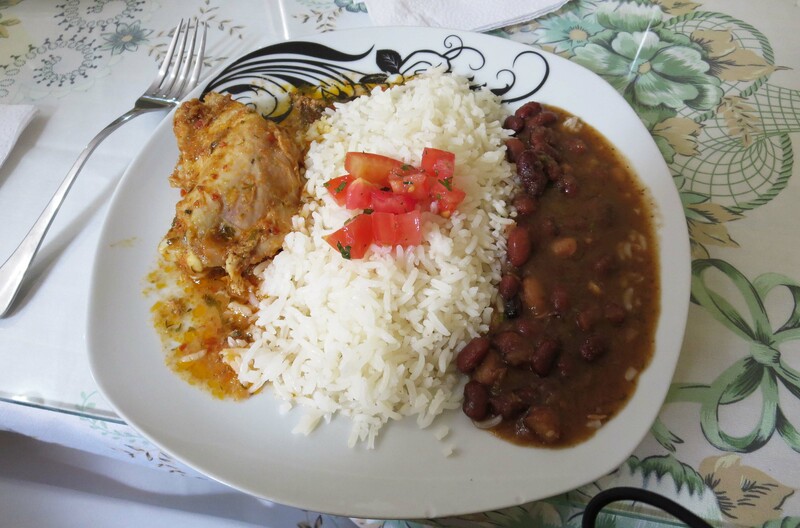 The soup is then followed with a main dish consisting of rice, a side of beans or legumes, and a small piece of meat. This is accompanied by a glass of fresh-squeezed fruit juice. I’ve been served piña (pineapple), naranjilla (not sure of an English equivalent, but it tastes similar to orange), maracuyá (passion fruit), durazno (peach), and mora (blackberry), to name a few. By the end of the meal I can pretty much guarantee you’ll be full (though there may be an exception for teenage boys). Besides filling you up for the day, there are other benefits to ordering almuerzo. Since the food is already prepared (or constantly in preparation), your food is served fairly quickly. There’s also a very family/communal feel to the meal, with everyone in the restaurant visiting and sharing the same meal. Add in the fact that the whole meal costs somewhere between $1.50-2.75, and it’s pretty hard to pass up! *Note: In the tourist areas you can pay up to $6.50 for the same meal you can get elsewhere for around $2.50. We prefer to look for the places where we see lots of locals eating, and I have yet to be charged more than $2.75 for a meal. The one exception being Banana’s Café, which charges more for their almuerzo, but the food is absolutely delicious! Their almuerzo and all of the menu items I’ve tried are amazing, and well worth paying the extra cash on occasion.